The thought of retirement is both an anxious and exciting proposition. The end of a career can leave us wondering who we are and who we will become without our job description. Visions of unscheduled and endless expanses of time offer contradictory images of boredom and fulfillment. What will we do to fill the hours that suddenly reappear before us each day? Time appears vast, unscheduled, and waiting to be filled. We speak to everyone we know about the approaching change. Depending upon their experiences, we hear retirement stories of babysitting grandchildren, over fifty communities, downsizing, and warmer climates. We hear of new opportunities for exploring long forgotten pastimes, like painting or golf. We envision new occasions to travel, read, exercise, and explore. We consider resuming hobbies left languishing for years as we focused time on our jobs and children. Bucket lists resurface or move to the forefront as we realize that while our time may be running out, what remains seems to appear empty before us. We are living longer than ever. Magazines, TV, and other media encourage us to stay active and vital – reminding us that age is only a number. For many of us, writing becomes an option. After all, we have a lifetime of experiences and wisdom, or writing is a dream that’s been on the back burner. Finally, we now possess the time to sit down and tell that story. Writing seems to be exciting and exhilarating. The creative process is fulfilling and rewarding. The idea of putting words on paper and serving them to an audience becomes appealing and seems straightforward and easy to fulfill. And then the reality sets in! I am one of many who chose that option, and I would like to share some of what I have learned. Writing is a fulfilling way to spend one’s time. Playing with words, shaping a story, conveying a message is creative. It is an outlet that allows our voices to be heard and our ideas to be visible. 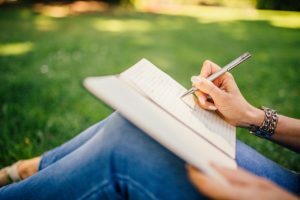 If you are like me, you may have always journaled – writing your experiences for years and making you feel capable of the next step. But be forewarned, at least from this writer’s perspective, the retirement pastime soon develops a life of its own. The creative process quickly becomes not just a hobby but a full-time job. So be prepared. It is exciting and stimulating to expand our minds and experiences. But journaling is one thing. Getting a story down on paper is another. You will awaken in the night with ideas that must be put to paper or thoughts which need to be reworked. If you decide to publish you will likely soon discover how little you know about the process. Publication and marketing are beasts of a different sort. You will learn how much you are expected to grasp and the letters OJT – on the job training – will be resurrected from your working life. They will take on an urgency unimagined as you deal with publishers, editors, rewrites, blogs, and layouts. Even in the most supportive and encouraging of environments – of which I was fortunate to land – it is easy to become overwhelmed and experience a level of stress never imagined since walking away from the celebration of your retirement party. 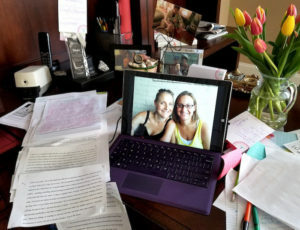 As you diligently struggle to accomplish every task on the seemingly endless list placed in front of you prior to publication, there is a new phenomenon that appears in your path. It presents itself before you have finished reviewing “second pages,” seen an ARC of your upcoming project, scheduled a “launch party,” or held your final book in your hands. It is there before you can master the tweet, track the hits to your website, or learn to successfully boost your posts. It begins slowly and randomly, then increases in speed, regularity, and power. It reappears as you are beginning to enjoy your accomplishments, see the light at the end of the tunnel, breathe regularly, and sleep. It happens when you begin to believe the process is winding down. Yet, before you can confirm a venue for your celebration, envision what you will wear, or begin to practice your “author signature,” the question is there. Unless you plan to turn out a book on a regular basis, here is my advice for how to best handle that situation: Take a deep breath, smile, and forgive them, they know not what they ask!